​12 tracks: A Fork In The Road * Once Upon A Time * The Best Of Times * When I’m Dead * First The Children * Heartland * The List * Farewell Fitness * Ballad For Billy * Freedom Lost * Breakup * Voices. 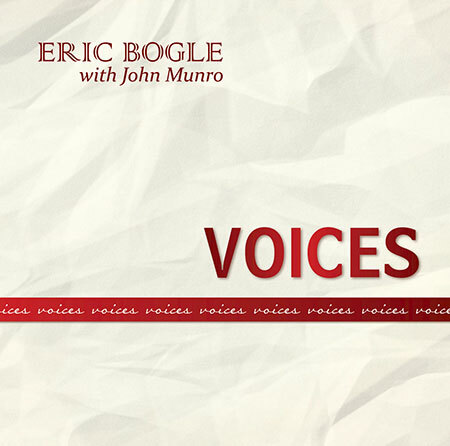 Greentrax Recordings is proud to have been associated with Eric Bogle since 1989. In those 27 years Greentrax has released all of Eric’s live and studio albums, including his collaborations with long-time buddy and touring partner John Munro, plus various compilations and the 5CD box set Singing The Spirit Home. Voices is another amazing collection of songs - eight from Eric himself, probably one of the greatest songwriters of the past several decades. There are two songs from John Munro, one from Peter Titchener and a song sent to Eric by Simon Wilkins. The album is eagerly awaited from Greentrax by the legions of Bogle fans in the UK, Europe and beyond, and will not disappoint. A Fork In The Road - a tribute by Eric to his “partner in crime”, as he describes John Munro. Once Upon A Time - keeps us guessing, but Eric says “...no fairy story but no guarantee of a happy ending either”. When I’m Dead - which he hopes “will not be before 2045!”. First The Children - a subject which Eric has visited before and expects to do again. Heartland - described as “being out there or maybe inside us”. The List - in which he looks at the things he “still misses about Scotland”. Freedom Lost - the persecution of various sections of the population in Nazi Germany in the 1930s. Breakup - “some relationship breakups are civilised - others, however…”. To sum up, this is Eric’s usual varied interpretation of life and the world about us. John Munro contributes The Best Of Times, from his life in Glasgow which includes a harmony with his late Dad, plus Voices, dedicated by John to “the voices of singers, poets and artists who have inspired, informed and changed us through the centuries”. Pete Titchener, who also produced the album, has one contribution: Farewell Fitness, a request by Eric to Peter to write a song that “sums up his life’s philosophy, something that would give those who hear it an emotional and spiritual lift… this is his contribution”. And the song Ian Green of Greentrax has kept to last is Ballad For Billy, written by Simon Wilkins for his late nephew Billy Spencer. “Billy was 26 years old when he lost his life in a tragic accident. His parents donated his organs to help others, his heart went to a young father of three beautiful daughters. Later Bill’s Mum and Dad listened to their son’s heart beating in that young father’s body - imagine that if you can. And a further four more lives were saved by other organs Bill provided. The song was written by Simon the night after Bill died”. Eric really liked the song and recorded it, as he has done with other similar submissions. Eric surrounded himself in the Adelaide studio with great musicians: John Munro (acoustic guitar, mandolin, lead vocals on his own tracks and harmony vocals on others); Peter Titchener (acoustic guitar, lead vocals on his song); Emma Woolcock (fiddle, cello); Jon Jones (percussion); Damien Steele-Scott (bass); Kathie Renner (piano); Peter Franche (accordion); Leonard Cohen (slide guitar); The Bogle-ettes (singers on Voices). All mastering and artwork in Australia, Designfolk completed the artwork in the UK. Eric’s 2013 album A Toss Of The Coin was another collaboration with John Munro. It was of course Eric Bogle who wrote the classic And The Band Played Waltzing Matilda and No Man’s Land (The Greenfields Of France), which were placed No.1 and 5 respectively in a Celebrity Top 50 Songs Poll in a national newspaper, above such international artists as Bob Dylan, Elvis Costello, Leonard Cohen and John Prine.